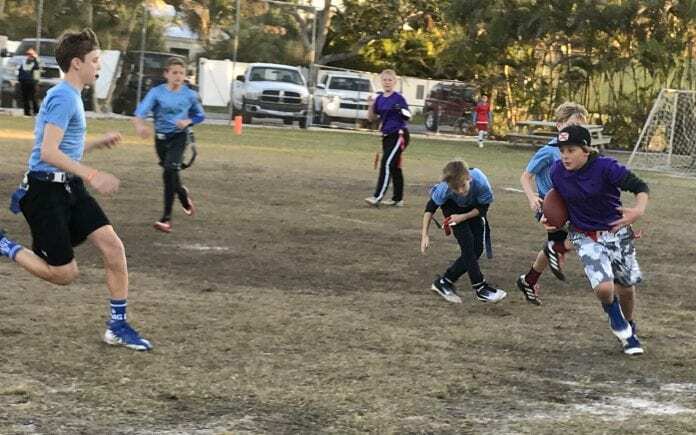 Playoff fever hit the gridiron at the north end of Anna Maria Island as the youth flag football league starts to wind down for the season. The second-ranked Blue Lagoon faced the third-ranked Tyler’s Ice Cream last Wednesday night. Last week’s semi-final games were an exciting lead-up to this week’s match-ups for all three of the age group leagues. With his female dominated team, Coach Rob Alderson, owner of Tyler’s Ice Cream, led his team to the first touchdown of the game on their second offense possession of the game. 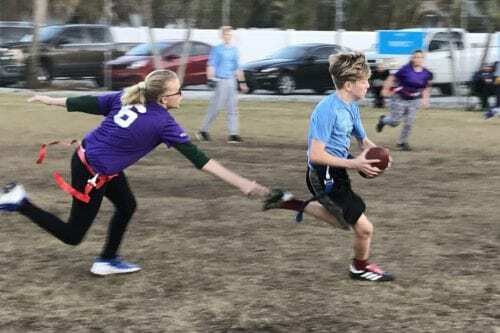 After huge yardage gains by Cash Carter and defensive flag pulls by Sam Leister and Kale Petrin for Team Blue Lagoon, quarterback Ava Alderson hit Carter on a long pass with a strong run after to put him in the end zone. Ava Alderson found Caleb O’Connor for the extra point moving the score to 7-0 for Team Tyler’s Ice Cream. Strong on offense as the QB, A. Alderson also brought her A-Game to the defensive side of the game with a flag pull on the first down play to John Holbrook. The ladies of Tyler’s Ice Cream played a critical part of the season, including a critical second down play flag pull by Torri Fidler. On third down, what would appear to be a touchdown by Jiles Kirkland III was negated due to an impeding rusher call on the Blue Lagoon center, giving the football back to Alderson’s team. Blue Lagoon’s Matt Speidel pulled the flag on the first down snap. A sneak play resulted in a four-yard gain by Reese Riley leading to another A. Alderson-Carter connection short of the first down. After an incomplete pass, Speidel made a nice reception short of the first down, with a flag pull by Fidler. Fidler soon found her hands on the ball with a beautiful interception cause by the tipped pass. While in scoring range, A. Alderson threw a scoring pass to O’Connor for another six points. With the score 13-0, resulting from the missed point after, the one-minute warning for the first half was called by the official. A. Alderson’s younger sister, Josie Alderson, put the quick pressure on Blue Lagoon’s David Patterson, but Patterson threw a first down pass. Holbrook caught the next pass, but lost his footing before he could gain additional yardage as the scoreboard clock only showed seconds left. Blue Lagoon coach Jeff Holbrook called for the first timeout after J. Alderson’s sack. Lining up with two wideouts, Holbrook used his height as a receiver to his advantage catching the football in traffic, snagging it out of the air in the end zone. Another J. Alderson sack kept the score at 13-6 to end the first half of semi-final action play. The second half of the game put Tyler’s Ice Cream on offense. Riley, Carter and A. Alderson continued to play strong football moving the ball down the field. On a miraculous pass by A. Alderson, Carter found his way into the end giving his team a 13-point lead with the score 19-6. Matt Speidel sped down the sideline on the first play of Blue Lagoon’s possession. Carter made a flying, diving flag pull to prevent the touchdown. A. Alderson stopped the first down carry by Kirkland. Despite the strong pressure by rusher A. Alderson and the near sack, Holbrook hit his receiver for a Blue Lagoon TD. Speidel scored the point after changing the score once again to 19-13. With the help of Tres Maddox on defense, Patterson pulled the flag of Carter on the Tyler’s Ice Cream first down play. On third down, A. Alderson fired the ball, but Kirkland intercepted the catch and ran it back for a score tying the ballgame 19-19. After the pick-six, and with the game’s momentum swinging their way, Blue Lagoon worked to prevent another Tyler’s Ice Cream touchdown. Carter’s ability to catch the ball on the run helped to put another six points on the board. Leading again by six points, Tyler’s Ice Cream went on the defensive with Nicholas Yatros on the field. Riley stopped field advancement twice with great flag pulls. In the pass-only zone, on third down, Speidel gained the first with a run past midfield to within five yards from the end zone. Yatros’ flag pull prevented the score initially, but on first and goal Petrin threw the ball to Holbrook to once again tie the game. On the point after, from the five yard line, the quarterback hit Patterson in the hands for the go ahead point advancing the score to 25-26. In the last minutes of the game, Tyler’s Ice Cream worked hard and never gave up, with an impressive run by A. Alderson. With lost yardage due to a flag guarding call on the run, the Blue Lagoon defense stepped up preventing the catch by J. Alderson. The first down catch by Carter kept the hope alive. A flagrant foul call on Blue Lagoon put Tyler’s Ice Cream in position to take the win. Maddox made important flag pull stopping Carter before the score. The tough rush by Maddox forced A. Alderson to throw the football on second down with nobody near the ball. In a perfect play, A. Alderson fooled the rusher evading the sack. A. Alderson’s pass was on the money, but Riley just could not make the winning catch in a heartbreaking loss for Tyler’s Ice Cream. The championship game will be won by Blue Lagoon or Planet Stone to finish out the 11-to 13-year-old flag football league.